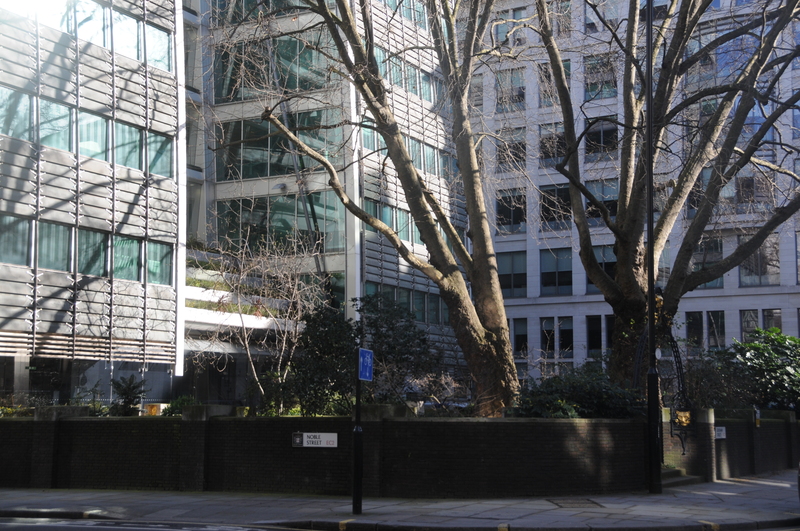 Back in the City, my next stop was a short walk down Gresham Street to find another small garden in the centre of the city. This photo is the garden on the former churchyard of St John Zachary taken by my father just after the war. 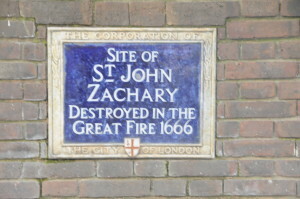 The church was partially destroyed in the Great Fire of London in 1666, and was not rebuilt and what remains is the site of the former churchyard. 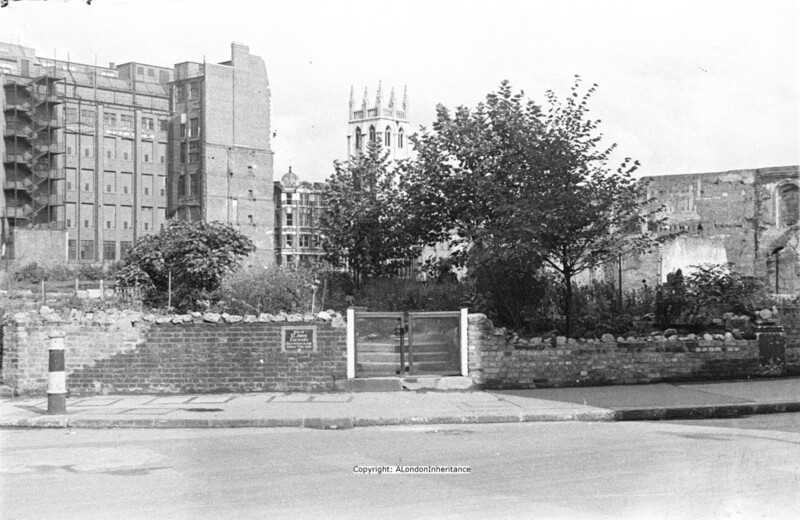 During the blitz the site was converted into a garden and the site won the Best Garden on a Blitzed Site award just after the war. It has remained a garden ever since. The following photo is taken from roughly where I believe may father took the above photo. The plaque on the wall in the original photo has moved to the right and although not visible is on the wall heading to the right of the above photo. What looks like the original plaque, now slightly relocated. I am sure this is the angle the original photo was taken from, as checking the map, the church tower seen in the background of the original photo is St. Alban in Wood Street, Whilst this is now obscured by office blocks, it can clearly be seen in the following map in the correct position from where I took the later photo, from the cross roads, looking across the garden. I always like finding locations that appear in the background of photos, so I took a walk round to St Alban and what I found is either one of the most depressing views, or a wonder of survival. 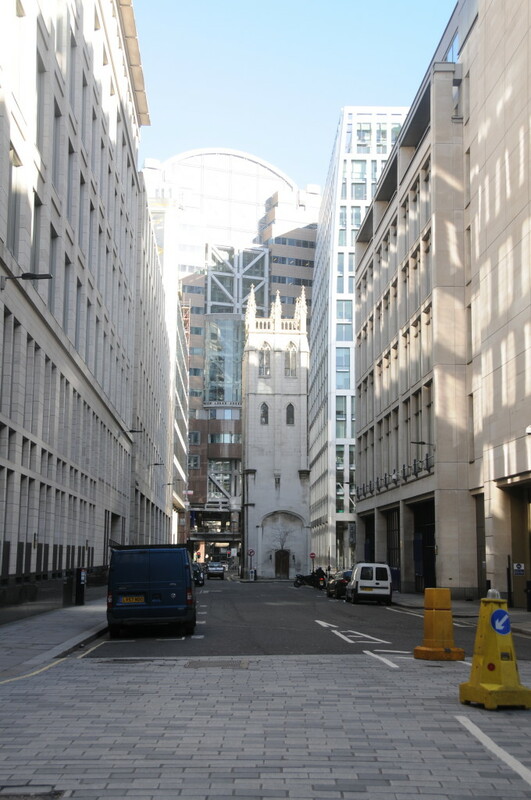 The following photo is looking down Wood Street from Gresham Street looking at the tower of St. Alban. The tower is the only surviving part of the church and where once it had stood clear of the surrounding buildings, it is now surrounded on all sides by towering office blocks that are getting steadily higher and higher. It is no longer a church, the tower now houses the offices of a corporate finance advisory firm. I am really pleased that the church tower has survived so we continue to have tangible evidence of the number of churches that once supported the population of the City of London and the Wren architecture of these churches that were generally rebuilt after the Great Fire, however I still find it very depressing that a building that once stood taller than its surroundings and held a special place in the daily lives of the population, is now dwarfed by the size and architectural style of the surrounding buildings. Almost being crowded out of a location that has functioned as a church for many hundreds of years. The following engraving of St Alban from 1810 shows the church standing clear of its surroundings as it would have done from when it was rebuilt between 1682 and 1685 and the later half of the 20th century when the surrounding office blocks were constructed. The change that the tower has seen in the last 330 years is incredible. 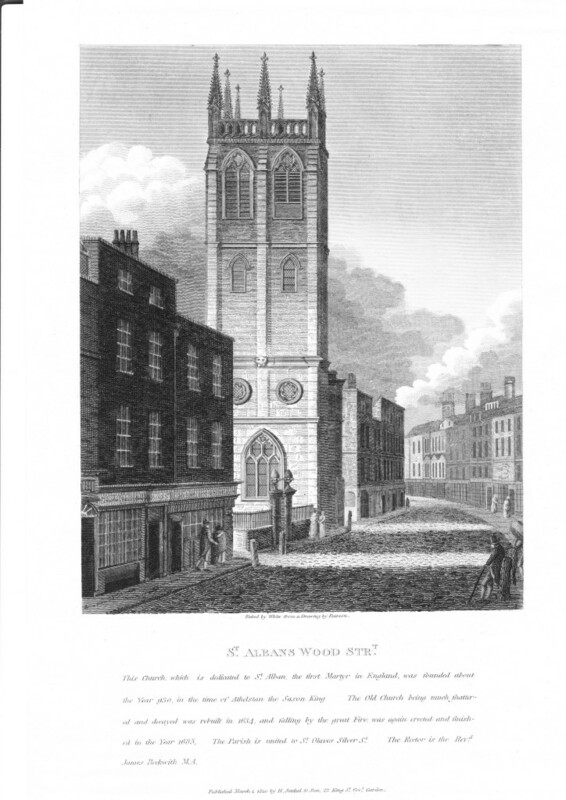 A view of the Wren church of St. Alban Wood Street as it stood in the early nineteenth century (1810). Engraved by William Johnstone White from an original drawing (now in the British Museum) by William Pearson. Where once, standing on the top of the tower would have provided wonderful views over the city, with only the spires of the other city churches breaking above the roof level. Now, you would be staring straight into the floor of an office, with many other floors stretching above. 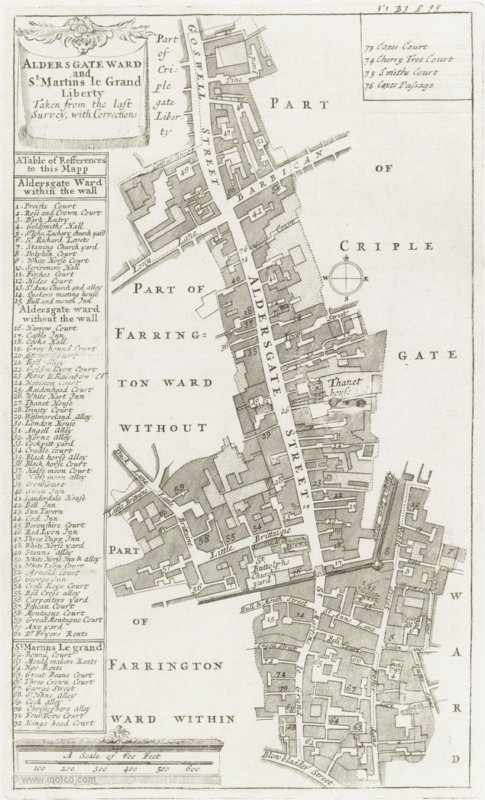 The churchyard of St. John Zachary is labelled as number 5 in the bottom right of the map (just to the left of A in WARD). Noble Street (which still exists) is clearly visible running vertically past the churchyard, however Gresham Street does not exist. Maiden Lane running past the churchyard where Gresham Street is now. If you continue to the bottom of the map there is the wonderfully named Blowbladder Street. 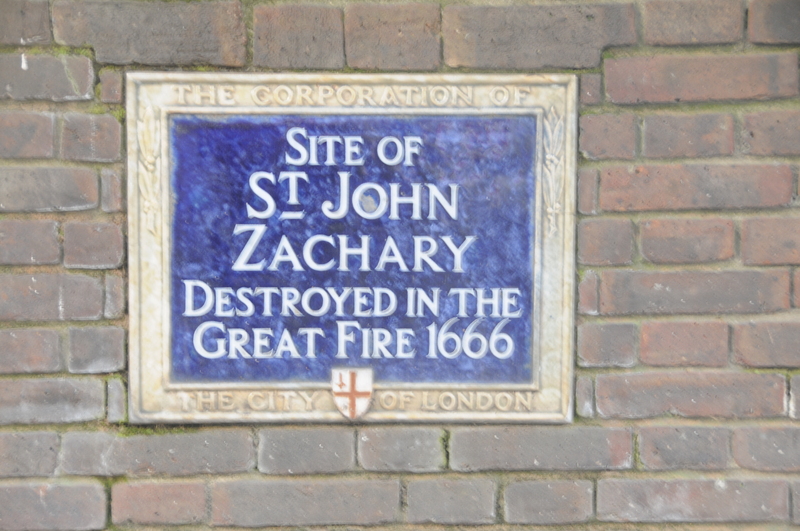 Aligning this with current mapping, this is now part of Cheapside. Defoe gives an origin of the name Blowbladder Street in his “A Journal of the Plague Year” where he states: ” and which had its name from the butchers, who used to kill and dress their sheep there (and who it seems had a custom to blow up their meat with pipes to make it look thicker and fatter than it was, and were punished there for it by the Lord Mayor)”. Time to move on, but next time you see a church tower standing clear above the surrounding buildings or landscape, please remember the tower of St. Alban fighting to retain a link with the past against the tide of encroaching office blocks. This entry was posted in London Churches, The Bombed City on March 9, 2014 by admin. So interesting David. I really look forward to your blog every week. I wonder where you’ll go next?